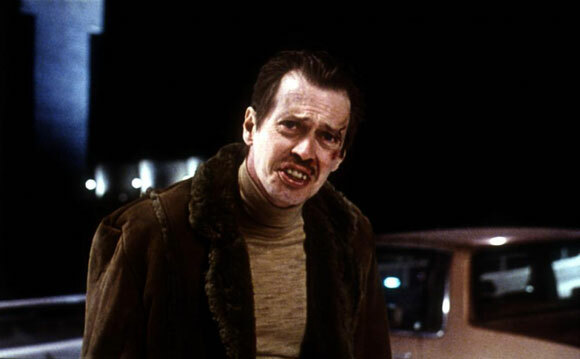 While the successful television series Boardwalk Empire has brought the unique talents of American actor Steve Buscemi to the attention of a wider audience, many cinephiles from around the globe have been following his varied movie career for over 25 years. Warning: this list has a few spoilers for the following films – Desperado, The Big Lewbowski, Fargo and Reservoir Dogs. SPOILER WARNING – “The American” (Buscemi), a level headed cocky gringo and friend of the film’s titular character (Antonio Banderas), tells a Tarasco bar story way better than the “Pick-up Guy” (Quentin Tarantino) tells a joke in the same watering hole some time later. Unfortunately, like the motor mouthed auteur, he gets wasted way too quickly in this over-the-top comic actioner that displays a quite cavalier disregard for pretty much all of its supporting cast. 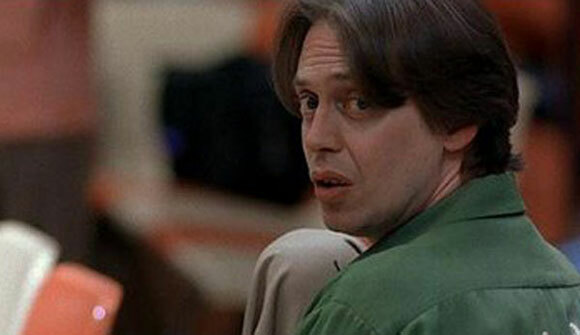 SPOILER WARNING – Poor Donny (Buscemi) spends most of the movie being brow-beaten by his bowling buddy Walter (John Goodman) for asking pertinent questions during the latter’s far-fetched and rambling stories. 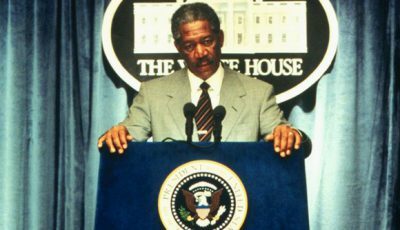 A key supporting role in which his character seems to be the only person – aside from The Dude (Jeff Bridges) – who doesn’t have a violent, criminal (if one ignores the smoking of weed) or manipulative disposition. 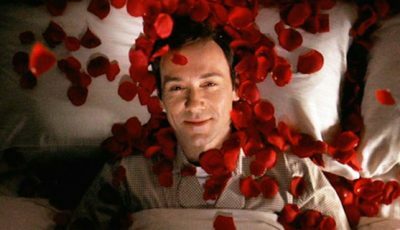 Plus, his futile death provides one of the most pathetically poignant funeral moments in American cinema. 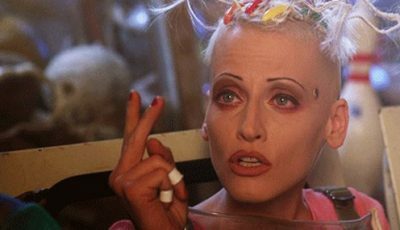 Rockhound (Buscemi) is the wise cracking genius in a bunch of ragtag oil drilling misfits that is sent to an approaching asteroid by NASA in order to nuke the thing before it reaches Earth. His usefulness, however, is undermined by a bout of space madness which kicks in shortly after he and the other surviving crew members arrive on the rock. Why director Michael Bay gags the actor – who is easily as talented as any other member of the cast – for the climatic moments of the mission is anyone’s guess. A reasonably insipid, albeit intelligently made, feel good movie about show biz in which Buscemi quite effectively plays the rogue element, being a nagging, petty and sometimes unscrupulous paparazzi who is in self denial about who he is and what he does. A strong and watchable performance in an otherwise weak film that somehow fails to consolidate on the success the actor and director Tom DiCillo achieved together with Living in Oblivion 11 years earlier (see below). 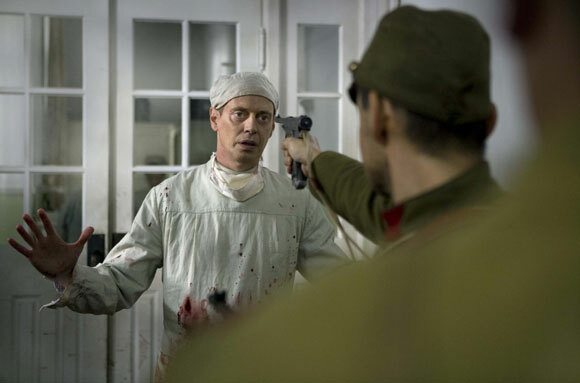 Buscemi is tough and unsentimental as Dr Robert O Wilson (1904-1967), the American physician who found himself helping Chinese refugees in an international safety zone set up by German businessman John Rabe (Urlich Tukur) during the brutal invasion – and subsequent occupation – of Nanking by the Japanese in the second half of the 1930s. 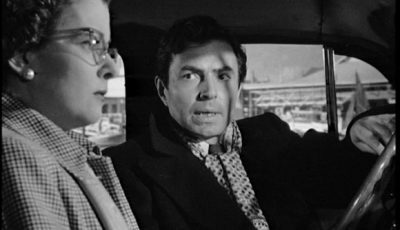 It is far from a sympathetic or remotely comic role, with the vehemently anti-Nazi Wilson being particularly wary of the zone’s founder – even after the latter’s wife has seemingly been killed during a harbor bombing raid by the Japanese. 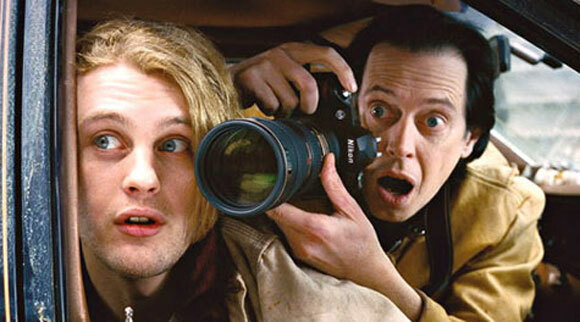 When journalist Pierre Peders (Buscemi) – a cocksure political hack with serious life issues – tries to interview actress Katya (Sienna Miller), the pair seriously walk the line between the likeable and unlikeable, the trustworthy and untrustworthy and the honest and deceptive as they try and outdo each other. It’s really only at the very end of the movie that both characters reveal their true selves. 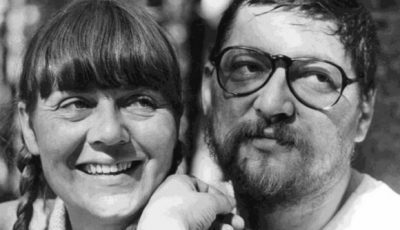 The actor/director also co-wrote the well-paced script (with David Schechter), basing it on a 2003 Dutch cinematic work written and directed by the late Theo van Gogh. 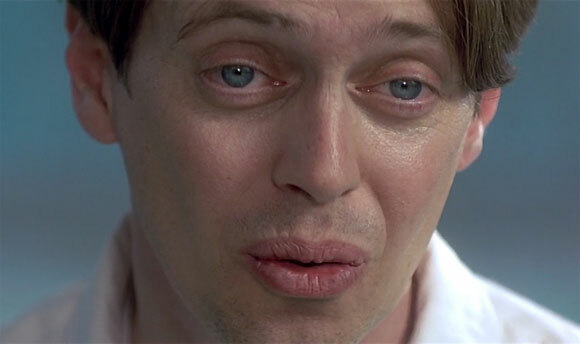 It’s impossible not to like Seymour (Buscemi), the single, forties-something, blues loving, vintage record collecting geek, whose outward awkwardness hides his undeniably impressive intelligence. Indeed, Seymour seems so vulnerable that even members of the staunchest Moral Majority clique would probably overlook the fact he ends up being romantically involved with a teenage girl (Thora Birch) who has just finished high school and is probably not even half his age. But then again it’s a love story – and not a bad one at that. SPOILER WARNING – Uppity kidnapper Carl Showalter (Buscemi) suffers one of the grimmest fates in the history of American film after he spectacularly botches the collection of an $80,000 ransom from a rich businessman (Harve Presnell) before trying to rip off his psychopathic partner-in-crime (Peter Stomare). 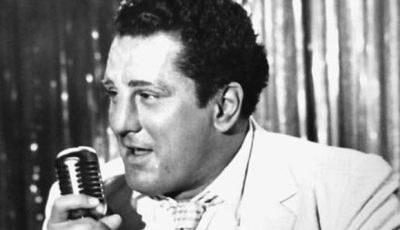 Loose and loud, the vociferous and in-your-face Showalter is pretty much a train wreck waiting to happen – and when he does eventually crash and burn it’s macabrely spectacular. “That skinny little man butchered 30-something people up and down the eastern seaboard. They say the way he killed those people makes the Manson Family look like the Partridge Family” – Hannibal Lecteresque serial murderer Garland Greene (Buscemi) as described by Baby O (Mykelti Williamson) after he is escorted onto a hijacked prisoner plane by the unwitting authorities in Con Air. “Well, he’s on the right flight,” Cameron Poe (Nicholas Cage) replies. As it turns out, Greene does end up catching the right flight. 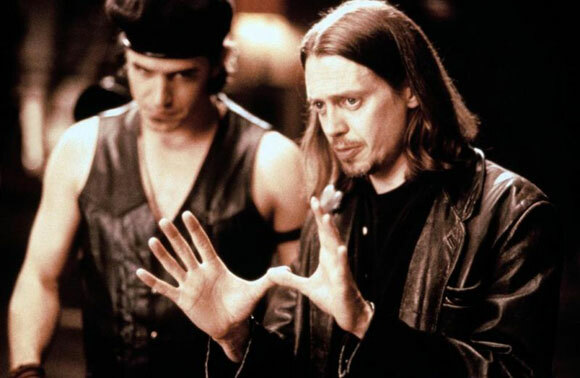 SPOILER WARNING – Mr Pink (Buscemi) is probably the smartest member of a group of diamond robbers which is double crossed during a heist, realising pretty much immediately after the event that it was probably a set up. 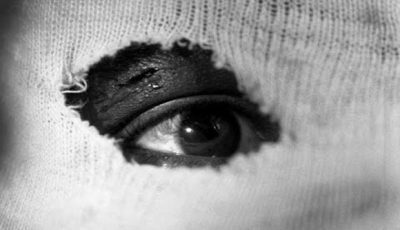 He is also the one who gets away from the crime scene with the stolen booty, although he eventually gets killed off-screen as he makes his getaway in the movie’s final minutes. Independent film maker Nick Reve (Buscemi) faces all sorts of traumas while trying to direct a low budget movie – including a carton of rancid milk on the set, post-one night stand rivalry between his two lead actors (Catherine Keener and James LeGros), a surprise visit by his senile mother (Rica Martens), accusations of stereotyping from his cast’s dream sequence dwarf (Peter Dinklage) as well as a secret yearning for his leading lady. By the end even the viewer is unsure what’s real and what isn’t. A beautifully controlled multi-faceted performance in one of the most abstractly intelligent works about movie making ever to grace the silver screen. 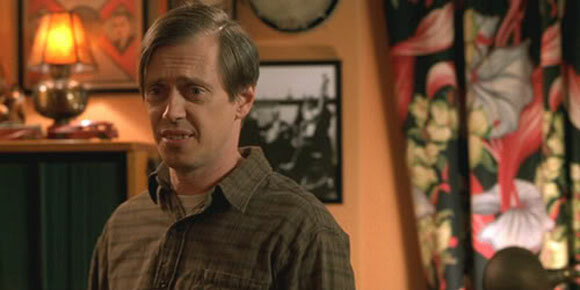 Your turn – what are your fave Steve Buscemi films and performances? His roles in Reservoir Dogs, Desperado, and Fargo would be my top three, in that order. He’s got lots of good stuff to choose from, though. Great list. 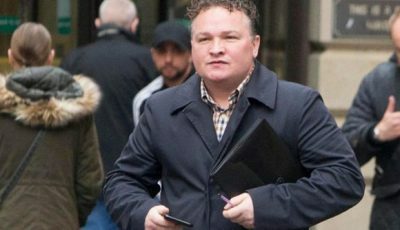 Thought he was brilliant in Reservoir Dogs – probably my number one. 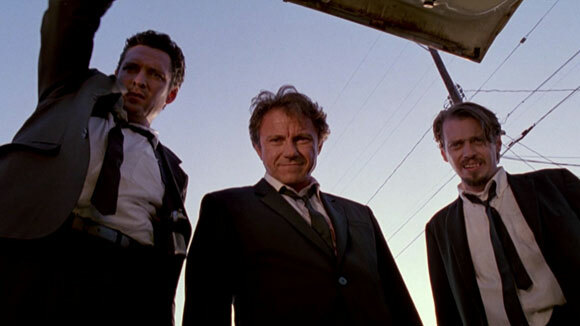 Oh duh… how could I possibly forget Reservoir Dogs! Great call! 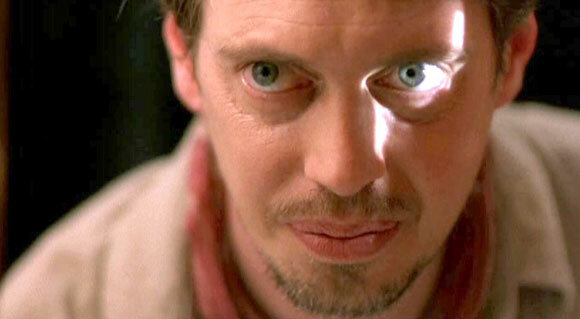 Reservoir Dogs is my fave Buscemi perf. Love him in Reservoir Dogs but he’s so memorable in everything he does. Ghost World, Armageddon, The Big Lebowski – all great. I need to see Living In Oblivion so thanks for the recommendation. Con Air & Reservoir Dogs. You could throw anything he’s done with the Coen brothers on this list but Fargo and The Big Lebowksi are definitely the best of the bunch. There are quite a few bit-parts that leave an impression – What To Do In Denver and Wedding Singer ring bells. Good to see Interview and Delirious make the list. Great list! 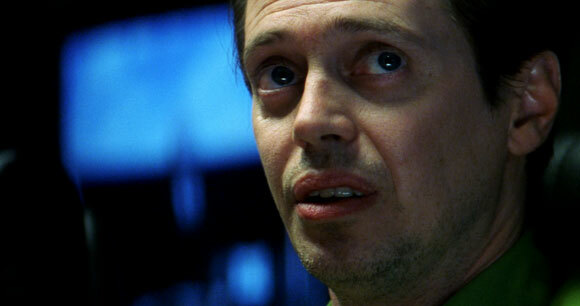 Buscemi is one of my favourite actors, ever since I saw Con Air as a kid. So creepy! Some films on this list sound like I need to check them out. Thanks mate! FARGO. GHOST WORLD. His cameo in BARTON FINK. Great actor. Favorite performances are from The Big Lebowski and Fargo. Great list! So happy Interview was ranked at all, let alone so highly. Love that movie. Some classic Buscemi performances here and a few I haven’t seen surprisingly. Armageddon and The Big Lebowski tie in my book as well. Fargo is amazing and might be closer to the top of my list with Reservoir Dogs and Con Air in the 2 and 3 spots. One performance of his that would make my list is Airheads. I love him in that movie. Totally underrated.